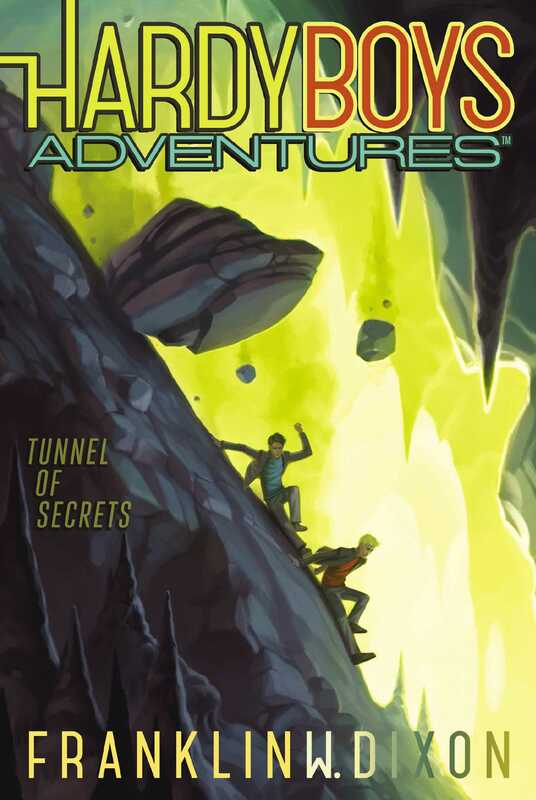 When Frank and Joe set out to explore caves and tunnels, they dig themselves into some dark and dangerous trouble in this Hardy Boys adventure. When a sinkhole opens up and swallows one of Bayport’s historic statues, Frank and Joe suspect something—or someone—shady at play. They jump at the chance to investigate; Joe as a member of an urban exploration club, and Frank as photographer for the school paper. But in the thick of their search, the boys stumble upon an entire underground city that’s been abandoned for years. Now the city is home to a cultish band of criminals who plan to take over Bayport. Frank and Joe are determined to shut down the crooks, but after being barreled down by a boulder and nearly squashed by a runaway train, they have to wonder: are they in over their heads? MY BROTHER JOE WAS ALREADY more than six feet underground when one of our hometown’s most famous landmarks fell through a giant hole in the earth. It was early Saturday afternoon. Just about all of Bayport had been planning to attend a street fair on the other side of town, but last week’s disappearance of a couple of Bayport High School kids had put a stop to that. Instead most of the townspeople were gathered on the lawn of the square in front of city hall, waiting for Deputy Hixson to start a press conference. With our esteemed—and estimably grumpy—chief of police, Olaf, on vacation, the job of leading the investigation had fallen to his young protégé. But since Deputy Hixson’s daughter, Layla, happened to be one of the missing kids, he had a lot more at stake than just impressing his boss. I felt bad for Deputy Hixson. He’s a good cop. He’s also a lot nicer than Chief Olaf when Joe and I interfere with a police investigation, which kind of happens a lot. As Bayport’s foremost amateur detectives, Joe and I have a special knack for solving crimes. It isn’t our fault that a couple of teenagers happen to be better at it than the local police. We weren’t officially looking into the missing kids, but Joe was friends with Layla, and I think he liked her as more than a friend, too, so we were keeping a close eye on things. Joe wasn’t at the press conference, though; he was under it! He was helping Urbex—the local urban explorers club—map some of the old tunnels hidden under Bayport, the same tunnels that we had helped discover on another case. Police press conferences were usually pretty dull, anyway, so we didn’t think he’d be missing much. But I wasn’t just at the press conference to investigate. I was also there as a photographer. A camera can be one of a detective’s most important tools, and I was intent on learning my way around my new digital SLR. I turned around to find Charlene Vale scribbling in the little notebook she carried everywhere. Charlene was the news blogger for our high school’s newspaper . . . and, to be honest, she was another reason I was at the press conference. She was supersmart and supercute and I kind of had a little—okay, maybe not so little—crush on her. She wasn’t exactly warm and cuddly, though. Charlene took being an investigative reporter seriously, which I totally respected, even if it meant she was pretty intense sometimes. When I’d learned she was looking for a photojournalist to help document her stories, I joined the paper as a photographer. “Once the press conference starts, I’ll open up the aperture and use a longer lens. That will make the deputy in focus in the foreground with Delia slightly blurred behind him,” I told her. “Um, okay,” I said, feeling myself blush. Sometimes I forget that not everybody gets as excited about technology as I do. The Bugle was Bayport’s daily newspaper, and it usually drew a lot more readers than our high school’s student-run website. Not always, though. Charlene had already beaten the Bugle to the punch on a couple other big headlines this year. And this was a big story. Hundreds of people had come out to see what the deputy had to say—even some of the town’s homeless population. I noticed a guy in his fifties, who everyone called Sal, pushing a shopping cart past the courthouse steps. “I guess no one told you he was mute, huh?” I chuckled. Sal had been a fixture around Bayport for as long as I could remember. I’d always wondered what his story was, but since he never spoke out loud, I’d never been able to ask him. I’d sometimes see him mouthing things excitedly, only no sound ever came out. “I hear Delia Hixson is a member of the Mayflower Society,” Charlene said as Sal pushed his cart past where Layla’s mom was standing, waiting for her husband to address the crowd. “Don’t you have to be a descendant of one of the original pilgrims who sailed on the Mayflower to be a member of the Mayflower Society?” I asked. The history nerd in me got tingles. I hadn’t realized any Bayport residents were related to some of the colonies’ first settlers way back in 1620. Charlene nodded. “I found out while I was doing background for this story. They’ve been Bayport bigwigs since Colonial times, living around here since before Bayport was Bayport. Longer than that guy even,” she said, pointing over her shoulder to the large bronze statue of the Colonial navy officer that stood watch over the other end of the town square. “You mean the Admiral?” I asked, taking in the statue of Admiral James T. Bryant, Revolutionary War hero of the seas and one of our town’s foremost founding fathers. Apparently I wasn’t doing a good job impressing her with my knowledge of photographic technique or local history. “You got it.” I smiled. Score one for Frank Hardy! It was a spooky statue. The angry-looking, twenty-foot-tall Admiral held a large trident in his right hand as if he were Poseidon, king of the sea. And if the trident—which actually did look a bit like a giant three-pronged fork—wasn’t freaky enough, all you had to do was look at his other hand, which was missing its pinkie and ring fingers from a battle at sea. But that wasn’t the most interesting thing about his left hand. It was holding the coolest-looking book ever to his chest. The book was sealed with a clasp and engraved with all these strange symbols, like spirals, two-headed eagles, and an eye inside a floating pyramid similar to the one on the dollar bill. With his missing fingers and the way he was holding the book, it almost looked like the Admiral was giving the peace sign. There was also a giant bronze skeleton key dangling from a ring on his belt—the key to the city. What the trident and book symbolized, no one really knew for sure. “According to legend, Admiral Bryant’s ghost still haunts the old graveyard across town. It’s just waiting for his body to be returned to the empty spot in his family tomb alongside his wife,” I shared. I started thinking about the Admiral’s mysterious disappearance as Deputy Hixson approached the microphone. The statue almost seemed to be watching the press conference from the other end of the square. It really did give the whole scene a sinister vibe. Deputy Hixson had to pause to collect himself. I could see the pain on his face, and my heart went out to him. I knew firsthand how hard it was to have to investigate a family member’s disappearance. The crowd reacted with gasps and frightened murmurs. As the deputy spoke, I could hear a rumbling sound in the distance that I figured was probably just thunder. It wasn’t until I felt a vibrating sensation in my feet that I realized the sound wasn’t coming from the sky; it was coming from below. “There is no, uh, need, uh . . . ,” the deputy started to stammer midsentence. As the rumbling grew more intense, people looked around in confusion. “. . . panic.” Deputy Hixson had barely gotten the final word out when . . . It felt like an earthquake and an explosion all at once. The ground rocked under our feet, and a huge cloud of dust erupted from the other end of the town square as the earth collapsed and swallowed the Admiral’s statue whole.